Win a Save Your Bacon Weekend! - Hartke Is Online! Win a Save Your Bacon Weekend! Bring Your Bacon Home, Fry it up in a Pan, and Thank a Farmer! The Farm-to-Consumer Legal Defense Fund every year has a benefactor’s bash at Polyface Farm. This annual event is inspiring, casual, exciting. The people you meet are well worth the trip to Staunton, Virginia. 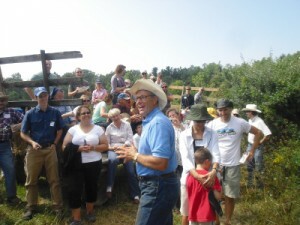 A big tent is pitched in Joel Salatin’s front yard, and a farm fresh lunch is served, after a hayride tour. This year, the event is going to be bigger and better, with lots of ways for people to participate. The Paleo community is coming out strong in support of farm food freedom issues, so this year we are inviting the Paleo activists and dieters to join with us in the Celebration! on Polyface Farm. We are building a strong alliance with the Paleo community, as they are leading proponents of grass based agriculture and whole foods eating. While some Paleo’s shun dairy and grains, there is growing diversity within their movement, as some leaders are actually now advocates of raw dairy and who knows, maybe some in the movement have discovered sprouted and soaked ancient grains. Regardless of our nutritional preferences, we all agree that farms like Joel Salatin’s Polyface are the way to future health and rural prosperity. For those who have found the FundRaiser ticket price too high in the past, we’ve added a walking tour with Daniel Salatin for a lower entry fee ($125 less and same great lunch! ), called Next Generation Celebration! Also, the ability to buy any of the Save Your Bacon Weekend events Ala Carte makes the event ever so much more inclusive! The Saturday event is now a full weekend, after the Celebration! on Polyface Farm, we head into the charming town of Staunton, for an evening event on Saturday, BaconPalooza, a bacon appetizer cookout with several well known Paleo chefs. Wolf, McGruther and Salatin Present a Full Day of Food and Fun! Then, on Sunday, Jenny of Nourished Kitchen blog joins Robb Wolf, author of The Paleo Solution–The Original Human Diet and Joel Salatin for a full day diet and cooking workshop plus Paleo lunch of Salatin’s pork and eggs, called P3, Paleo, Polyface, Porkfest. Join us for the Weekend in the beautiful countryside of Virginia, or come for just one day. See more details about the Save Your Bacon Weekend on the Farm-to-Consumer events page. Now Register to Win a Weekend for TWO! If you have a blog or facebook page, please share this raffle and help us spread the word! 🙂 We want the world to know these farms are precious and need to be protected! Kimberly Hartke is the publicist for the Farm-to-Consumer Legal Defense Fund. I bought a package of bacon today from a farmer…she said cook it up in a pan with lots of salt until it taste like bacon. I am excited to try it. I hope it taste good.